EUGENE, Ore.--(BUSINESS WIRE)--You can’t bottle the adventurous, nature-loving flavor of the Pacific Northwest, but Alden’s Organic has captured it all – from organic peanut butter cups to real cherry chunks to salted dark chocolate – in pint-sized packages. Attendees of the Winter Fancy Food Show in San Francisco will be the first to try them at Booth 6918 on January 13-15, 2019. 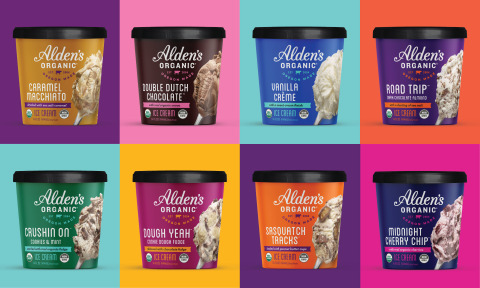 Alden’s also has a vibrant new lick-the-carton look for their entire portfolio of family size ice cream, pints, and novelties that celebrates the organic deliciousness inside. “Alden’s mission is to make organic ice cream irresistible for all,” says Hunt. “As leaders in the organic category since 2004, we are ‘all in’ on organic and letting the organic flavor realness shine through in every scoop, lick and bite. Our new packaging spotlights that signature true-to-flavor taste.” Alden’s will also be consolidating its novelty portfolio with its sister-brand, Julie’s Organic. The consolidation will incorporate top-selling Julie’s novelties and will hit the market in updated Alden’s packaging in Spring 2019. Alden’s Organic is America’s best-selling organic ice cream*. The brand was launched in 2004 in Eugene, Oregon where they still make every batch. Alden’s offers a full range of pints, family size ice cream, and frozen novelties. All Alden’s products are certified organic. The brand’s parent company, Oregon Ice Cream, is privately owned and has been making ice cream in Eugene, Oregon since 1938. Note to Editors: We'd love to send you samples of our new pints. Reach out using the contact information below and let us know which flavors you want to try! Alden's Organic to announce new line of organic ice cream pints and vibrant rebrand inspired by Oregon roots at Fancy Food Show this weekend.